Summer in the city can bring on a bit of sartorial confusion: dressing like you're about to hit the beach just doesn't make sense in any scenario (unless you're indeed getting on the A train headed to Far Rockaway). On the other hand, in order to remain New York-dwelling-relevant, you can't exactly just put away all of the dark hues that your wardrobe encompasses. It's all about remaining city chic in the blistering heat. Not an easy feat, but doable. While pinstripe was a huge trend this winter, there's no way it shouldn't extend to the warmer months in spite of its usually very wintery vibe. And there's no reason it has to look like you're headed to your 9 to 5 either. 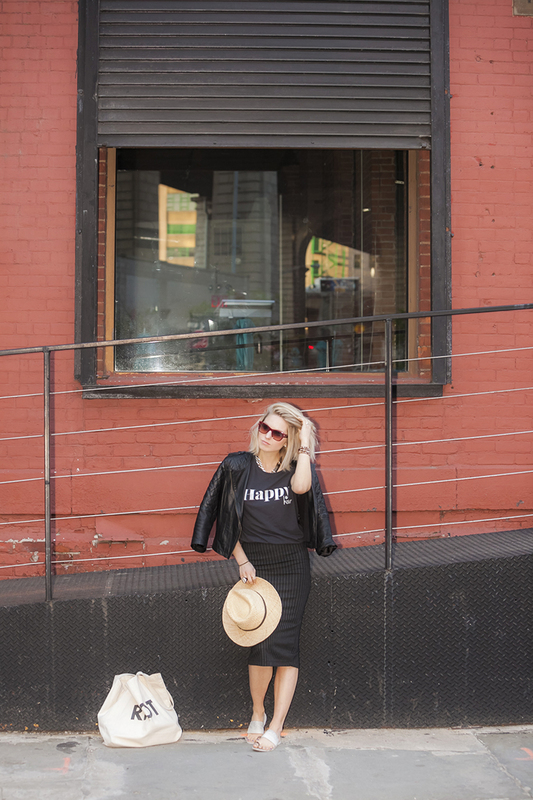 The key to balance, as always, is to juxtapose unexpected pieces together, like the irony of a happy hour tee (the softest ever, btw) paired with an office girl boss pencil skirt. A (not so?) subtle nod to summer equating to play time. Summer in the city means not channeling Baywatch, but ain't no harm in throwing on a straw lid for the hell of it. Love this look! I usually avoid black in the summer but the straw hat adds such balance. Loving this look! The shirt is great and the skirt is almost tuxedo looking so cool! I need that tshirt in my life - I love it with the pencil skirt! Love the match between the loose tee and the pencil skirt, it's perfect, I really like this outfit! One of my favourite! Ah, LOVE this look, you made pin stripes look chic and not dated! Good job! And love the tee! It is giving me ideas for the print shop and line of tees I am going to be putting up on Society 6. And DUMBO is a great place to shoot. My friend who is an amateur photographer must moved here so I am excited to do some shoots. Thanks for stopping by my blog earlier :) Great outfit! I love the modern take on the classic pinstripe pencil skirt! And kudos for maintaining your blog for more than 8 years already..good job!! Love, love, love! You look soo great! Kiss from a Brasilian woman! I love how you dressed down your pinstripe skirt with a T-shirt and flat sandals - I can see it looking very formal but this styling is more my taste :) very cool!